Our computer-to-plate technology utilizes pdf workflow software for seamless throughput and color profiling from proof to ink-on-paper. 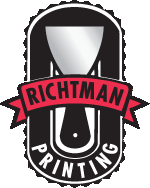 Our presses are all sheetfed and can handle paper sizes from 3"x8" to 19"x25". Whether your job requires 4-color process or Pantone Match inks, you will always get dazzling results. We also feature a full bindery that includes several cutters, folders for virtually any configuration, a 7-pocket stitcher-trimmer and various hand-bindery equipment.